1. Protection of constitutional rights and a gradual increase in social benefits for people with diabetes in Bulgaria. 2. Persuade the leadership of the need (and a large health, social and financial impact) to ensure the conditions for effective prevention, training of the whole Bulgarian population in a healthy lifestyle and diet, and regular screening of risk groups. Only thus will reduce diabetes pandemic in the country. 3. Providing conditions for effective, accessible, timely and modern treatment, supervision, training and control of diabetes and all diabetic complications. 4. Strengthening the role of self-training and activity of patients in the healing process and preventing complications. Use of Volunteers in this area. 5. Annual diet programs, free anti-virus vaccination and free training for people with diabetes in Bulgaria by qualified health professionals on different topics about life with diabetes. 6. Preparation, printing and distribution of educational literature on various topics of diabetes - manuals, brochures, flyers, etc..
7. Organization of national, regional and international discussions, press conferences, round tables, training seminars and discussions on key issues of diabetes and our suggestions for the most effective solution. 8. 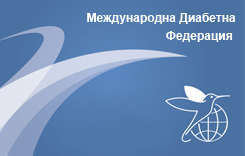 Annually conduct of the initiative "November - Month of diabetes" on the occasion of World Diabetes Day - November 14. One of our main task is to educate EVERY diabetic himself to maintain constant blood sugar in a relatively normal! It most certainly will prevent any problems and complications of diabetes and will provide a normal life ...! In Bulgaria there are over 500,000 people with diabetes! More about 300,000 still do not know they have diabetes or are preddiabet ...! If all are put together and clearly their needs, requests and proposals to the state, it is required to comply with them!